Opponents of the I-69 NAFTA corridor in the Midwest and the South can take heart from the partial victory of the corridor opposition in Texas. There are valuable lessons to be learned from this skirmish between grassroots citizen groups and the forces of globalization. In the face of widespread public opposition, the Texas Department of Transportation (TxDOT) announced on November 13 (www.KeepTexasMoving.com) that it is revising its grandiose plans for the construction of the I-69/TTC corridor through East Texas, one of the primary routes in the U.S. NAFTA corridor system (the NAFTA corridors in Texas were dubbed the Trans-Texas Corridor system, or TTC, by TxDOT). Though promoted by TxDOT as part of a state initiative to deal with regional traffic needs, I-69/TTC is really the Texas link of a planned transnational corridor that would run the length of Mexico, span the American Midwest, and cross into eastern Canada. The primary purpose of I-69, like that of I-35 and the yet unnumbered Ports-to-Plains corridor planned for West Texas, is to transport cheap commodities manufactured in the maquiladoras in Mexico and in the Far East (and imported through Mexico) to markets in the U.S. and Canada and to facilitate the movement of cheap labor from the South to the North (for background on the labor issue see, “Transient Servitude: The U.S. Guest Worker Program for Exploiting Mexican and Central American Workers,” Monthly Review 58.8 January 2007: 1-22). There are two distinct aspects of globalization driving the TTC/NAFTA corridor projects. The first is the transportation demands of global production and supply chains, and the second is the development and operation of transportation corridors as private enterprises under the auspices of the state. The privatization of a historically public service like highway transportation relies on the confederation of big capital and the states through which the corridors pass. This is the side of globalization that was challenged by activists in Texas. The State signed an exclusive development agreement with an international private-sector developer of transport infrastructures (Cintra Concesiones de Infraestructuras de Transporte, S.A.) to build and operate the TTC as a private toll transportation system. According to the contract, the company is entitled to the lion’s share of all toll and concession revenues generated by the project and obligated to pay only a nominal sum to the State. The State exempted Cintra from most state and local control and taxes, depriving Texas and local authorities of substantial current and future revenues. At the same time, the State assigned the un-funded liability of providing transportation emergency services to local authorities for the sections of the corridors in their jurisdictions. The Texas Legislature facilitated construction of the TTC system by passing a “quick-take” eminent domain law to expedite the expropriation of private land. Both elected officials and bureaucrats of the State of Texas actively promoted an amendment to the state constitution to allow the use of public money to finance the relocation of existing rail lines to the corridors. TxDOT restricted access to the mandated environmental impact statement that disclosed the negative social and environmental consequences of the TTC project. TxDOT officially committed substantial financial and human resources to promote the TTC project to the citizens of Texas. The TxDOT/Cintra contract was underwritten by the State of Texas by providing “bail-out” provisions by which taxpayers would assume financial liability for the project if the toll roads failed to produce satisfactory profits. In sum, the TxDOT/Cintra deal was a typical privatization scheme in which big capital, underwritten by the state, was to be the winner and the citizens of Texas were slated to be the losers. The contract, the full terms of which have never been made public, has not been voided. The TTC plan drew opposition from a wide range of individuals and grass-roots organizations that included landowners and local communities in the path of the corridors, property-rights advocates, environmental organizations, and anti-globalization activists who saw the project as an attack on working people and their communities by international profiteers aided and abetted by federal, state, and local politicians. Opposition actions ranged from rural “surveyor watches” manned by networks of ranchers and farmers, some of whom posted warning signs on their property and conducted armed patrols, environmental impact education projects hosted by local and state environmental groups, the production and distribution of educational videos, websites and weblogs dedicated to the issue and aimed at fostering effective political networks (see, for example, www.corridorwatch.com), numerous lawsuits against TxDOT and the State, and a variety of independent political actions, such as challenging TxDOT officials and leafleting attendees and at public meetings. In response to the outcry and organizing, Texas lawmakers eventually passed legislation aimed at restricting TxDOT’s ability to expand the privatization of Texas highways. 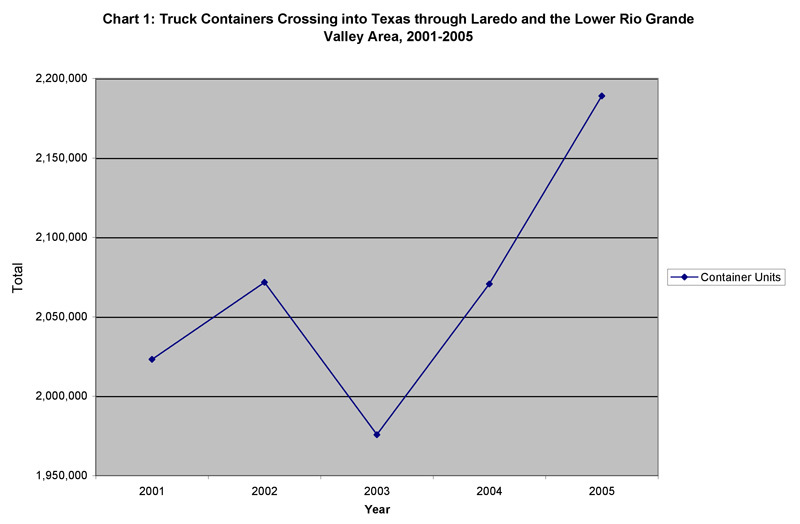 Chart 1 shows the official number of truck containers that crossed into Texas through the lower Rio Grande Valley area (Laredo, Hidalgo, and Brownsville) for the years 2001 through 2005, and preliminary figures indicate that the skyrocketing trend continued through 2006 and into 2007. TxDOT and U.S. DOT projections indicate that this number will likely double within the next ten years. The fact that the vast majority of this truck traffic is presently routed up I-35 explains the mounting pressure for a more direct route to the Midwest and beyond. Following the defeat of the original I-69/TTC proposal, the forces of globalization have introduced a backup plan to accommodate the flood of freight from Mexico. TxDOT’s alternative scheme is to build I-69/TTC in the footprint of existing US 59 through East Texas, the most densely populated area of the state, with a major by-pass to be built around the western edge of the sprawling Houston metropolitan area. The social and environmental problems created by routing massive transportation corridors through cities and suburbs are already well documented: extensive displacement and disruption of communities, local traffic gridlock, and dangerously high concentrations of ground, air, water, and sound pollution in areas of dense population. A contemporary tour through San Antonio, Houston, and Beaumont along I-10, a major highway in the TTC system, offers stark testimony to the blight caused by massive transportation corridors in urban areas. In terms of human health and social impact, the I-69/TTC backup plan is worse than the original proposal. I-69 is still slated to be a private toll road, but that contentious aspect of the plan is being kept in the background this time around. The new official spin promises faster construction, increased cost effectiveness, and less impact on property owners. The heart of the current proposal is to create a high-speed, high-volume transportation corridor by rebuilding the existing roads with toll lanes in the center of established right-of-ways and converting existing lanes into frontage roads to re-route local traffic. Expensive crossovers, which will have to be funded by local authorities, will be few and far between. Under the revised I-69/TTC plan, the partition of cities and suburbs will be extensive, while the cleavage of small towns in East Texas will be complete. The resulting concentration of traffic will aggravate existing pollution hotspots and spawn new ones. TxDOT has introduced a new community-level strategy for promoting the alternative I-69/TTC plan. While TxDOT officials held public meetings across the state to manufacture consensus for the original TTC plan (it failed! ), the main thrust of political action to promote the new I-69/TTC is preemptive. TxDOT’s new approach is to form local organizing committees that will be required to mobilize community support for the project. Each committee, recruited by TxDOT officials and steered by TxDOT staffers, will have a maximum of 24 members including local government leaders, port authority heads, economic development advisors, chamber of commerce members, and representatives of local and metropolitan planning organizations. Committee members will have to sign confidentiality agreements before they can participate. Under the new TxDOT strategy, public meetings will be held only after the organizing committees have done their work. The neocons have obviously learned from their past mistakes — the democratic process that stalled the original TTC/NAFTA corridor plan could be subverted this time around. This second assault against the people of Texas has already begun. Organizing committees are currently being formed and 10 town hall meetings in key cities are scheduled for January 2008. TxDOT will continue the campaign with 46 public meetings along the route of the corridor in February. Forewarned is forearmed. The fact that the new strategy is already underway suggests that the new response, utilizing the successful tactics of the past and embracing new ones discovered through practice, should begin immediately. Fortunately, most of the opposition organizations and networks are still in place. The coming contest promises to be tougher than round one; success this time will depend on a strategy that confronts the issue of globalization head-on. 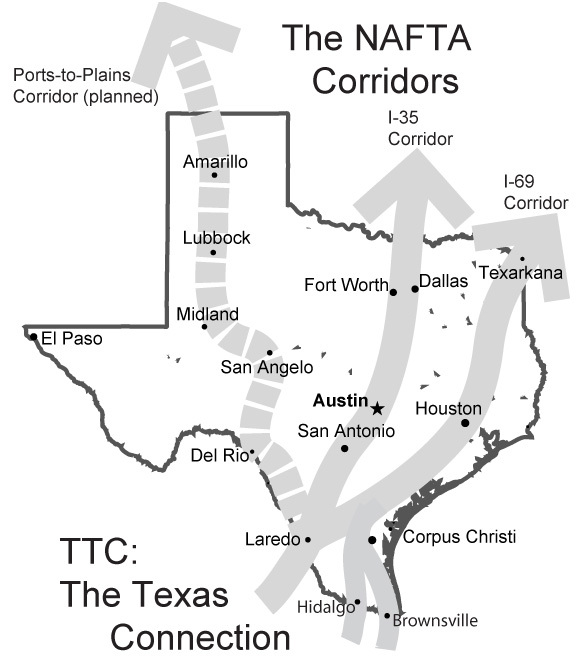 Because of its geographical location, Texas is the key state in the NAFTA corridor initiative and the outcome of the struggle over I-69 and the TTC system will shape the future of globalization struggles across the nation (the outcome of the I-69 struggle in Texas could be repeated along the route in Louisiana, Arkansas, Tennessee, Kentucky, Indiana, and Michigan). The Texas experience shows that ongoing opposition to global transportation schemes is important but the threat of social and environmental damage caused by massive global production and supply chains will persist as long as governments, at all levels, continue to sponsor the offshoring schemes of big capital. The launch of the second campaign for the expansion and privatization of transportation by the forces of globalization in Texas makes it clear that the populist challenge to big capital must be expanded to target the central tenet of global capitalism — the tyranny of the free market. The principle of sustainable economic growth, not shortsighted profit maximization schemes, must become the new global standard of governance. Nothing short of that revolutionary standard is sufficient to meet the escalating threats of globalization to the health and welfare of the nation.